colonelgrape: 92. It’s no secret that I’ve done a complete 180 on Champagne from earlier this year. I’m now a huge fan and love banc de noir….this bottle is no exception. Doing some research it’s the first and second press of a 0.8 acre section of Pierre Paillard’s Grand Cru vineyard so a limited edition wine. I tried to squeeze the glass into the photo so you can appreciate the golden color, it’s darker and fuller looking than other Champagnes. The visual translates to the nose and palate. Citrus, bread, apples, and chalk. I really enjoyed the balance betwen minerality, acidity, and fruit. The finish was incredibly long and smooth. More body than a blanc de blancs. If you aren’t sure of the difference between a classic blanc de noir and blanc de blanc Champagne taste this side by side with a blanc de blancs and compare them. I probably would have rated this higher if we opened it with a better food pairing. MobyGrape: 85. Unless it’s complete crap, it’s a pretty safe bet to say that I’m going to give champagne a good review. Lucky for me, the Colonel doesn’t buy crap, that’s really my domain. 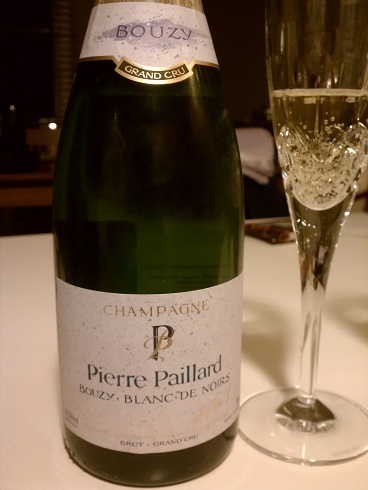 I’m learning I’m a big fan of these blanc de noirs, they tend to not be overly tart or apple juice tasting (since I seem to think a lot of champagnes taste like that). We had it with buttery delicious scallops because we couldn’t find another white in the house (real tough problem to have, I know) and it worked just fine. Score another one for champagne! This entry was posted in Champagne, France, Pinot Noir on November 10, 2013 by colonelgrape.